Windows Vista and newer, 32-bit or 64-bit. Ubuntu 14.04, 32-bit or 64-bit. Python: Versions 2.7, 3.4, 3.5, and 3.6. To use Navigator in online mode, you must be able to reach these sites, so you may need to add them to a whitelist in your network’s firewall settings. 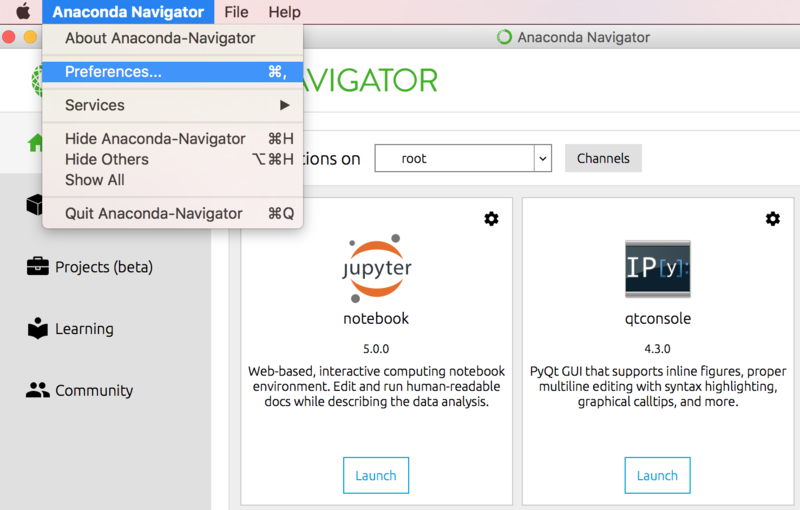 Navigator is automatically installed when you install Anaconda version 4.0.0 or higher. If you have Miniconda or an older version of Anaconda installed, you can install Navigator from an Anaconda Prompt by running the command conda install anaconda-navigator. To start Navigator, see Getting Started. To uninstall all of Anaconda see Uninstalling Anaconda. If you’re an Anaconda Enterprise subscriber, you can configure Navigator to search for packages in your local Anaconda Repository instead of searching on Anaconda.org. In the top menu bar’s Anaconda Navigator menu (on macOS it’s File), select Preferences. In the Anaconda API domain field, type the address of your local Anaconda Repository. 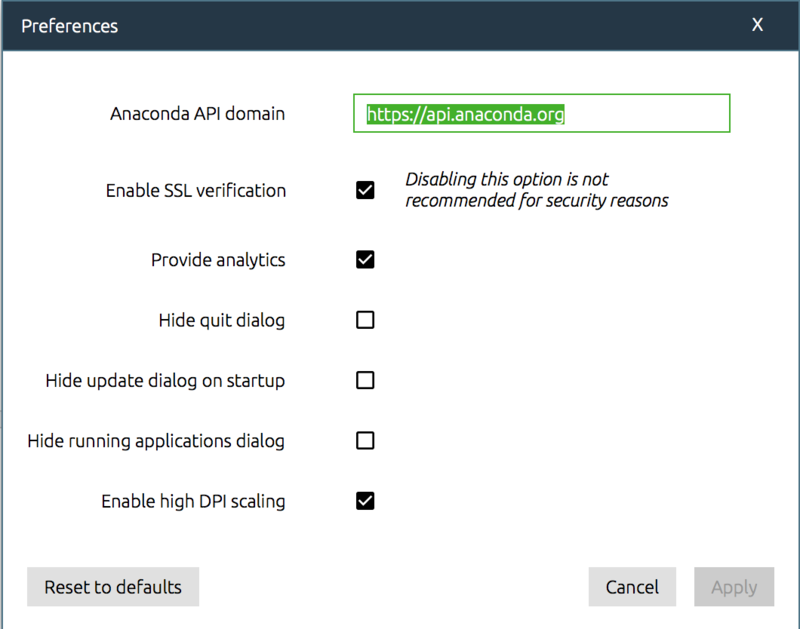 At the top of the Navigator window, click the Sign in to Anaconda Cloud button. 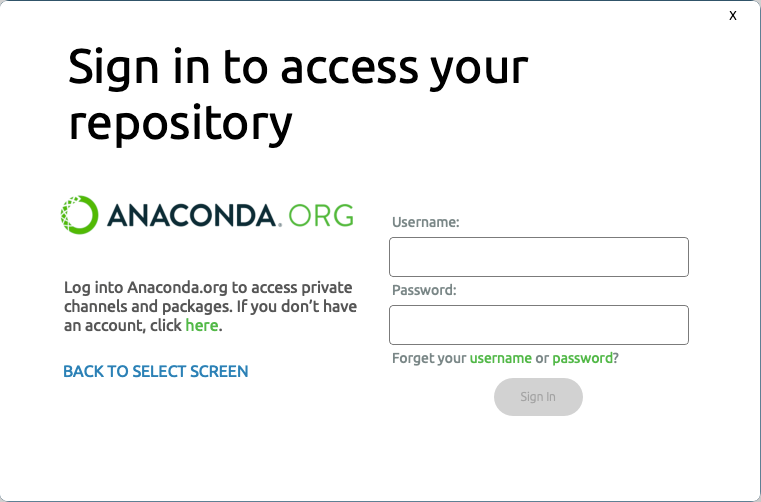 In the Username and Password fields, type your Anaconda Repository username and password.